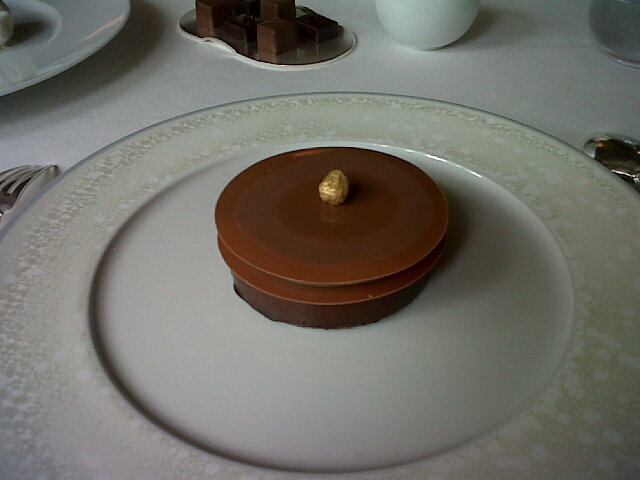 Today was my first visit to a Michelin 3 star restaurant, Alain Ducasse at the Dorchester. Set in the opulent surroundings of the Dorchester Hotel, this is the London outpost of Alain Ducasse, a man for whom Michelin stars rain from the very sky itself. We were early, and had a drink in the lounge area. Much to my wife's delight, Seasick Steve was being interviewed on a table nearby. The restaurant itself was very nicely done, about 20 tables and some private areas, and very elegant design was displayed throughout. My wife had a choice from a vegetarian tasting menu, the vegetarian dishes on the main menu and set menu. We were first presented with a pile of warm goujeres, these were fluffy pillows of cheese pastry, topped with salt, pepper and paprika. They were like eating little fluffy clouds, and were amazing. We finished off a few before remembering to take a picture. 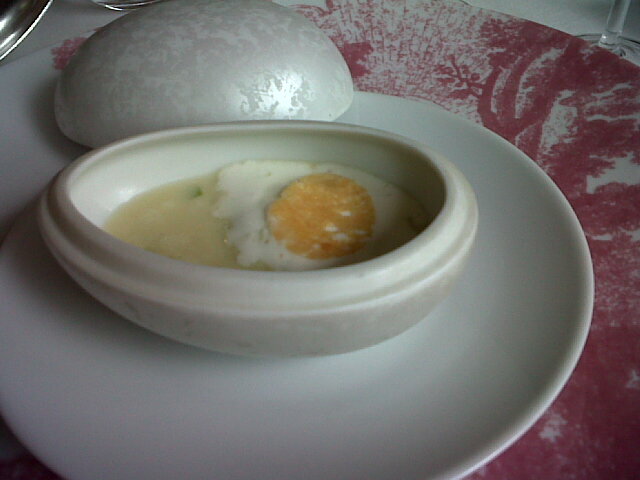 Next up we were presented with an amuse bouche, these came in a delightful egg shaped dish, and the lids were removed in front of us. Mine was a royale of foie gras, apple and celeriac foam. The foie gras was a rich dense liquid, contrasting with the sweetness and crunch of apple, with a creamy flavour of celeriac on top. As my wife is a vegetarian she had a special one prepared for her of celeriac foam, apple and a celeriac veloute poured to the side. Our starters followed. 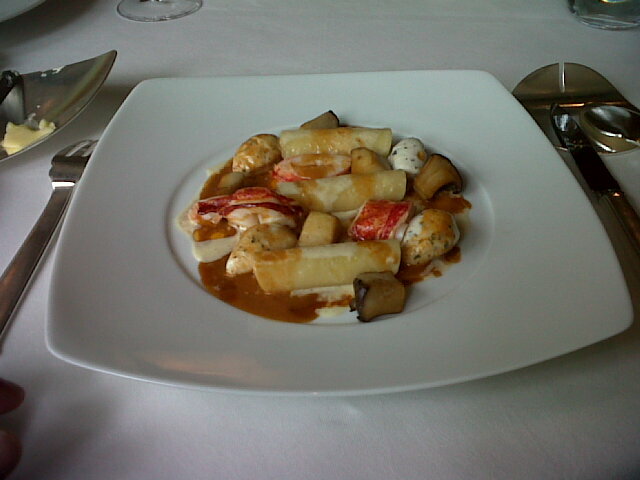 I had one of Alain Ducasse's signature dishes, saute gourmand of lobster, truffled chicken quenelles and homemade pasta. 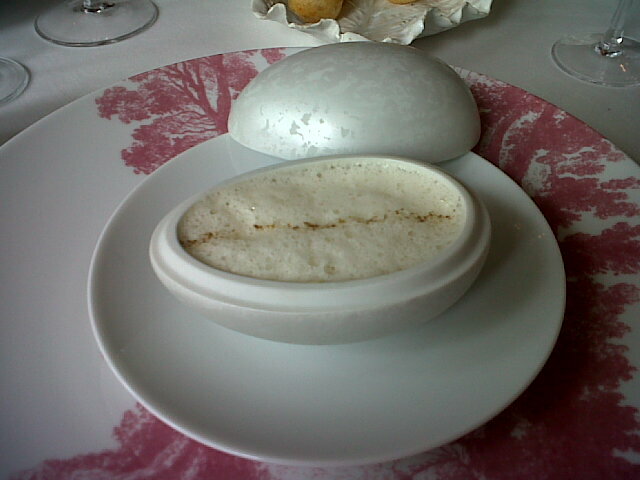 The quenelles were extraordinary light, full of truffle flavour and aroma, the lobster sweet and perfectly cooked. The pasta was al dente, and added texture. 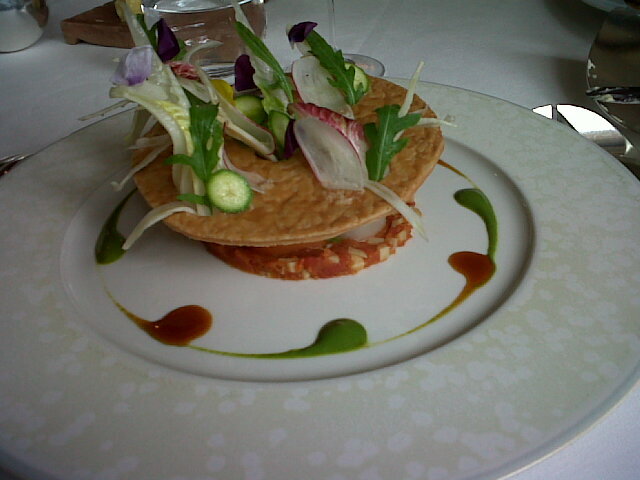 My wife had the raw and cooked vegetable tart. It was wonderfully presented, with the pastry coming as disc suspended in the middle of the dish above the cooked vegetables. 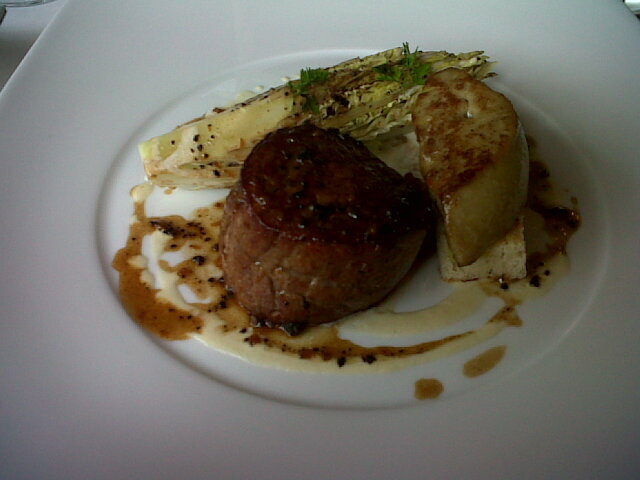 I had a classic dish for my main, Tournedos de boeuf Rossini. Fillet of beef, foie gras, cos lettuce and truffle sauce, with a side dish of potato, the name of which escapes me, which were wafer thin coils of crispy fried potato. Although I love foie gras, any more than a few mouthfuls is too rich for me and I had to leave some of it, but a piece of it together with the beef provided a rich note to the caramelised buttery beef with the rich truffled sauce being as good as they get, provided a perfect mouthful. I rarely get to eat fillet of this quality. Outstanding. 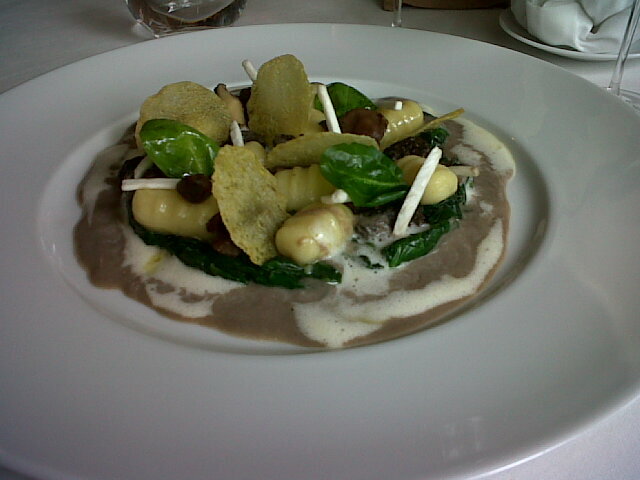 My wife had gnocchi, morel mushrooms and spinach. She had not tried morels before, and absolutely loved them. Next up, we were given mignardise (petit four), which appear before dessert for some reason. 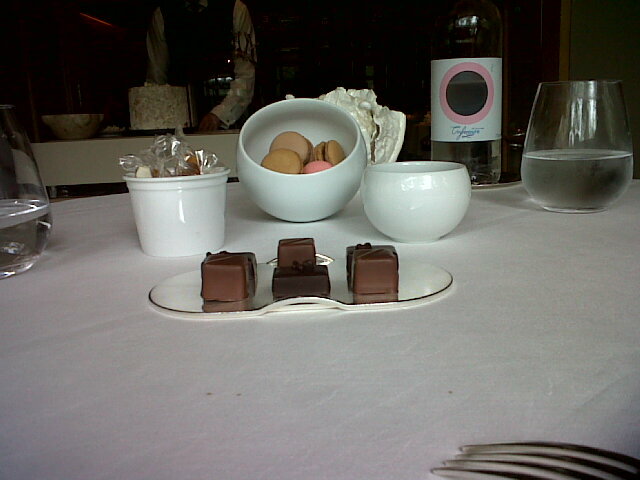 Dark and milk chocolates, rose, coffee and chocolate macarons, salted and plain caramels, nougat and chocolate hazelnuts. We hardly touched them and we asked them to package them up to take home, and came back to us in nice little labelled bags. 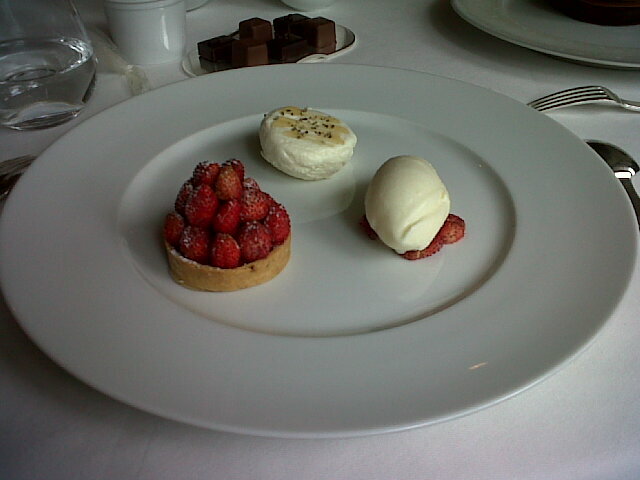 I had the chocolate and hazelnut biscuit. There was a crunch biscuit as the base, some sponge and mousse layers, chocolate ganache and hazelnuts, and a side of hazelnut ice cream. 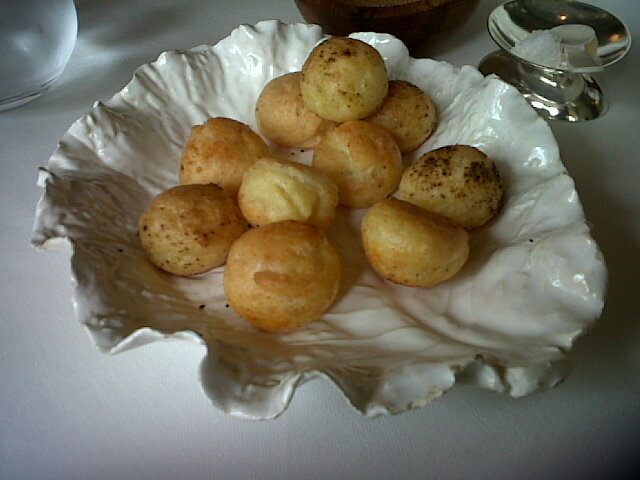 Although delicious, I probably should have had the legendary rum "Baba done like in Monaco", which is the same dish served at Louis XV, but I was worried it might have been a bit heavy after the foie gras. My wife had a glass of white with the starter, red with main. Both were recommended with to go with each. I drank water. We also had a glass of champagne to start. 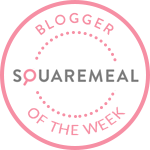 The meal, accompaniments and surroundings were refined and displayed a level of class I would expect from the 3 stars, the Ducasse heritage and The Dorchester Hotel. The stand out dishes were the foie gras amuse bouche, the lobster and quenelle and vegetable tart starters, although all were easily up to standard with the dishes we've had other starred restaurants. Service was simply exceptional. The bill came to 320 GBP / 490 USD.